It’s not a model railroad until you have track to run trains on. Track can be expensive, so to start out I purchased only enough to build the mainline. On my previous layout, I used Atlas code 80 track. 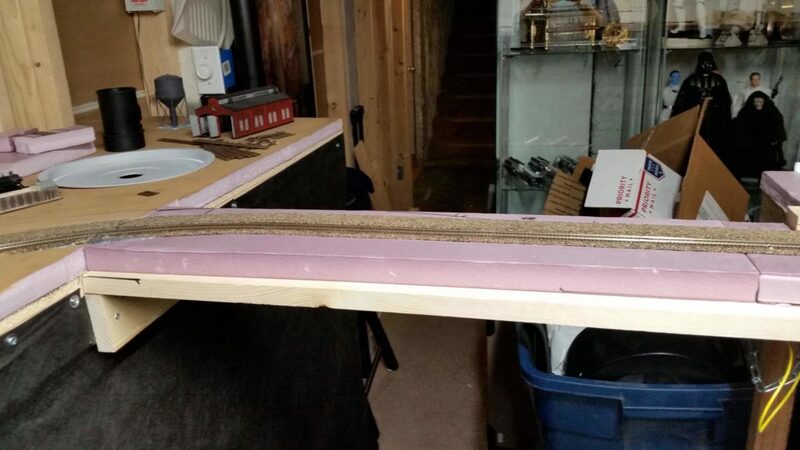 In model railroading, the “code” of rail designates how tall the rail is. Back then, I didn’t know any better, but realized later that code 80 track is quite a bit out-of-scale. In fact, if scaled up, a piece of code 80 rail would be about knee-high on a person. So this time around, I decided to go with code 55 rail. It’s much closer to scale, and the tie spacing looks much more realistic. 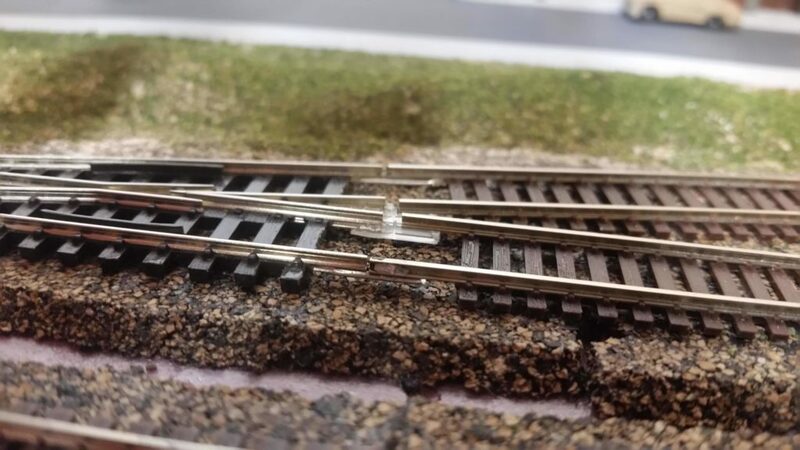 Eventually, I decided to use some left-over code 80 flex track in the staging yards, since I won’t really be doing scenery work in that area. You can see the difference in track in the photo below: Code 80 on the left; code 55 on the right. I also decided that I was going to use turnouts (switch tracks) from Peco instead of Atlas. Atlas turnouts gave me a lot of trouble on my old layout: Trains would derail through them, I had power issues, etc. 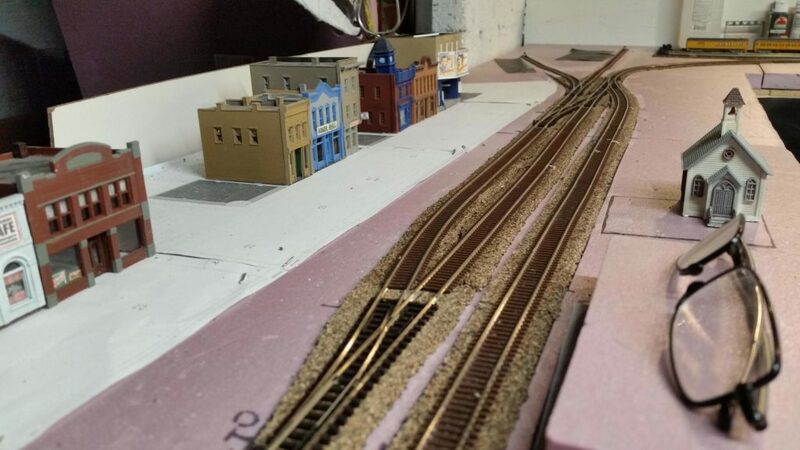 Peco turnouts have a much better reputation, and we use Peco HO scale turnouts at the local club. In addition, Peco turnouts have a built-in spring to hold them in position, whereas Atlas requires an external mechanism (ground throw, under-table switch machine, etc) to hold them in position. I like the simplicity of the Peco turnouts. After receiving my track order, I went to work. 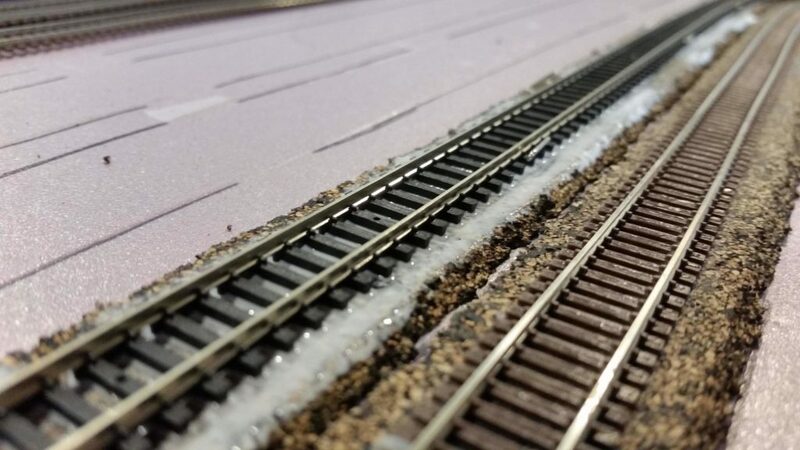 I secured the track by again using normal Elmer’s white glue, brushed onto the cork roadbed and then pinning the track in place. 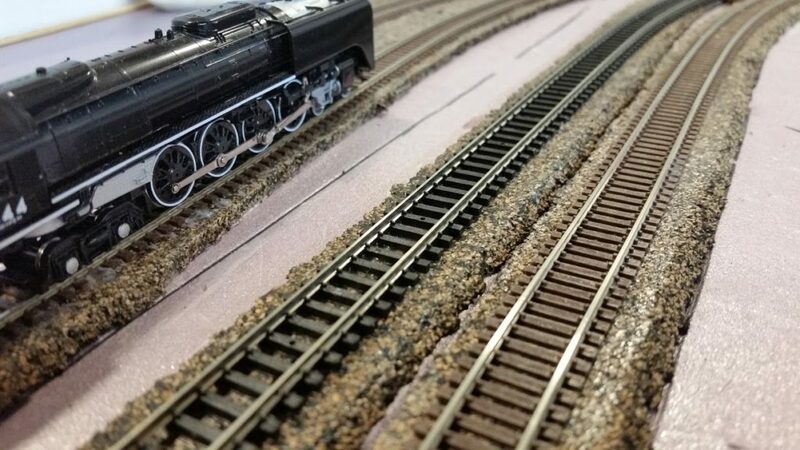 I used a combination of sectional (small sections of track) and flex track (30″ long sections that can flex into curves). Code 80 flex track pinned in place while the glue dries. I ran into a snag while laying track. Peco code 55 rail is different than Atlas code 55 rail (all of my flex and sectional track is Atlas). Peco code 55 rail is actually the same height as code 80 rail, but it’s embedded deeper in the ties (to make it hold better). This causes an issue, because if you place the rail joiner on the bottom of the Peco rail, then slide the Atlas rail into the other end of the joiner, the tops (heads) of the rails don’t align. This causes a very bad bump in the rail. Peco code 55 rail. Notice the extra “web” at the bottom. This causes the Peco rail to not align with Atlas rail. In order to resolve this issue, I first tried to grind the bottom of the rail off with a dremel. 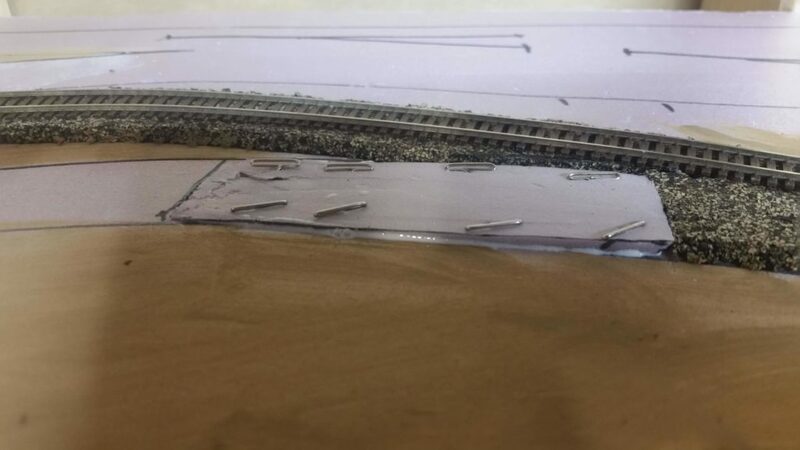 After doing a couple of turnouts this way (and nearly ruining them) I decided a better way is to put the rail joiner on the Peco rail, then pin the turnout in place on the layout. 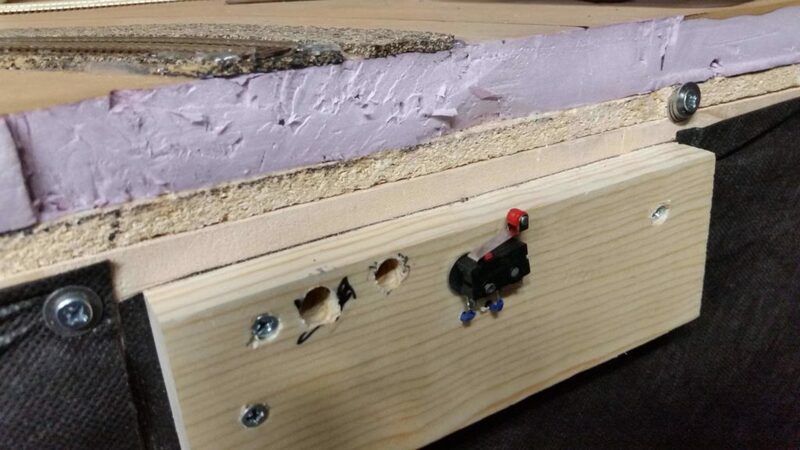 I then set the rail from the adjoining piece of track ON TOP of the rail joiner, pin it in place so that it is in gauge and straight, and solder the adjoining rail to the top of the rail joiner. This results in a rail joint that’s quite smooth. Here you can see the standard Atlas code 55 rail (right) soldered on top of the rail joiner to create a level joint with the Peco rail (left). The clear plastic rail joiner is an insulator to prevent short-circuits at the turnout. 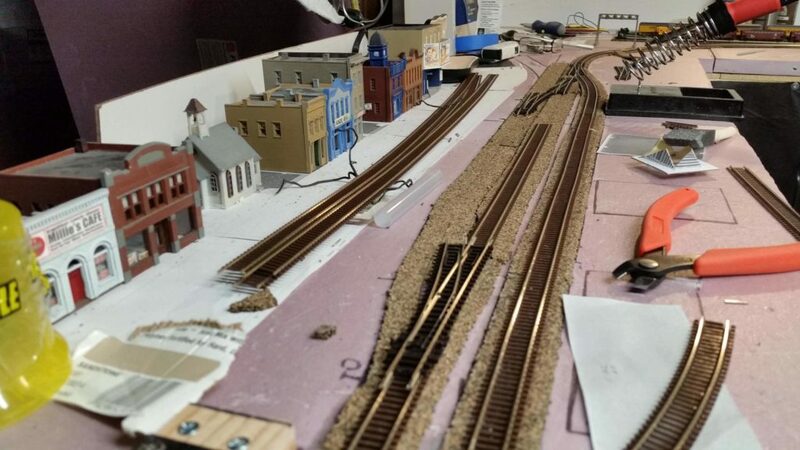 Over the course of a couple weeks, I worked my way around the layout to get the mainline down. The lift-gate proved to be a bit challenging. 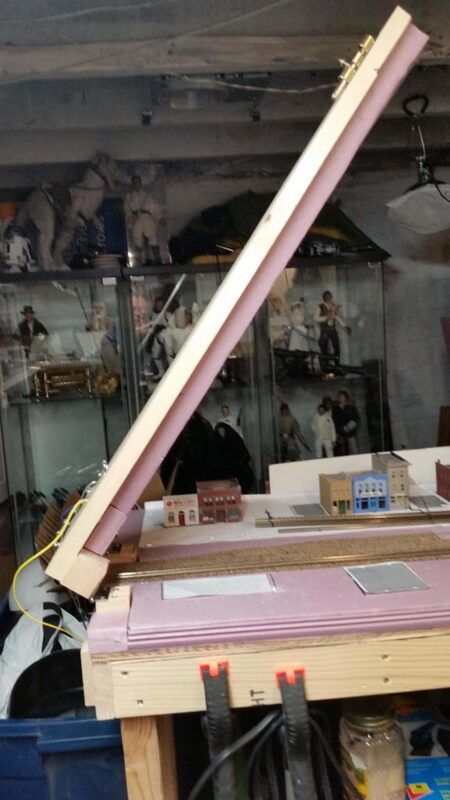 I started by putting the track down and gluing it in place across the gap where the bridge would lift, and across the gap where the bridge hinges. Once the glue was set, I cut the track with a dremel tool. This worked, except the rail in the flex track flexed just enough after I gut it (due to the tension of it being curved) that the rails no longer aligned. 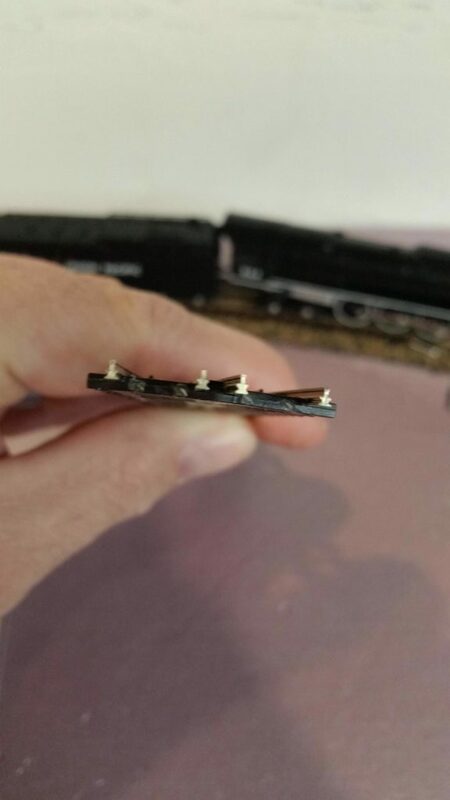 To remedy this, I pinned the rail in place and tested a train over it several times, then hot-glued the rail along the outside to hold it in place. I also hot-glued along the edge of the cork roadbed for good measure. This worked well. A lesson learned: If at all possible, make the tracks across a lift-gate straight. Track cut at the lift-gate. To wire power to the track, I ran two bus wires underneath the layout the full length of the bench work. 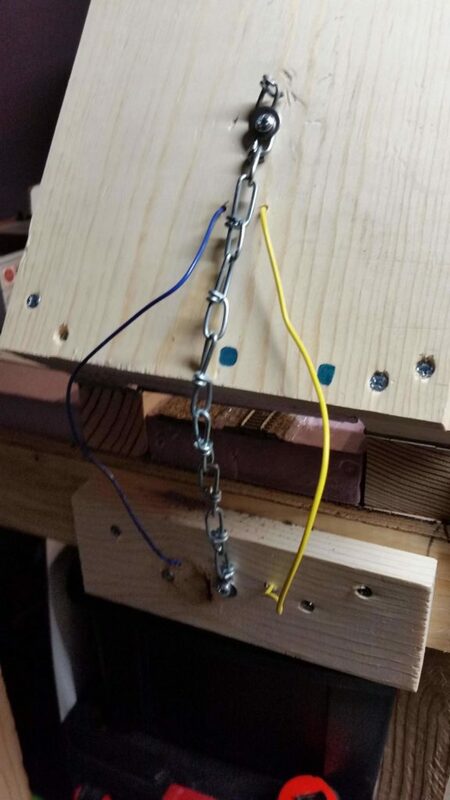 Then, I soldered “feeder wires” to the rails and dropped them down through the bench work. 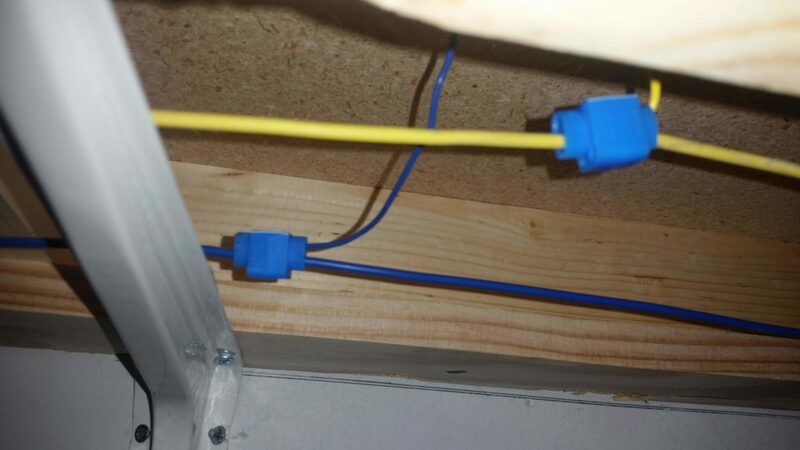 To connect the feeder wires to the power bus, I used “suitcase” connectors. Suitcase connectors work well, and are much faster and easier than trying to solder the wired together underneath the layout. To keep the polarity correct, I used a trick I learned from my friend Dave at the local club: Blue is the back rail (they both start with ‘B’) and yellow is the front rail. A couple of feeder wires dropped down from the track above to the bus wires. Once all of the mainline track was installed and powered, it was time for the first test run! 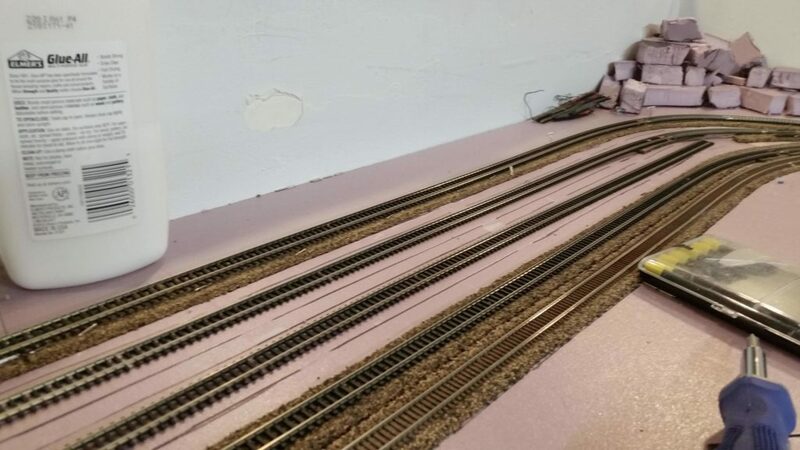 By the time I finished the mainline, I was able to order the rest of the turnouts I needed to finish all of the track except the freight yard. It came in a few days (yay Amazon) and I was able to finish laying all of the track except the freight yard while I was off work for Christmas. The rest of the tack installed in the town section. 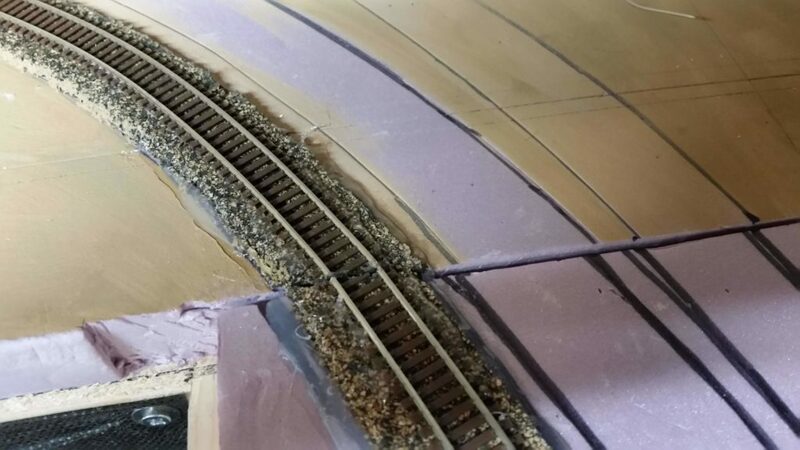 In order to make the transition from the mainline on roadbed to sidings that are not on roadbed, I cut my own inclines from left-over insulation foam. It took a few tries to get it right, but it works. Here’s one of my inclines glued and pinned in place. Power feeder wires to the track on the lift gate. The chain prevents the liftgate from swinging all the way over. The liftgate when it’s down. The liftgate when it’s up. You can see some of my other expensive hobby in the background. To prevent a train from accidentally running off a “cliff” when the liftgate is up, I installed this limit switch which cuts power to the track leading up to the liftgate if the gate is up. When the gate is lowered, it depresses the switch and power is routed to the track. Looks great Doug. I like your engine. Do you kitbadh any rolling stick or structures? Thank you Don! I haven’t ventured into kitbashing yet, although I have a couple of ideas I might try at some point.